A Visit from a Special Friend! 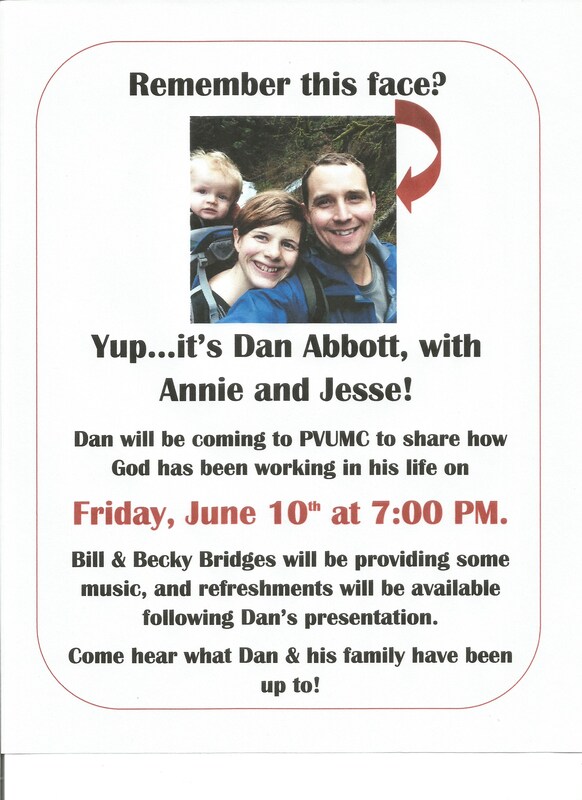 On Friday, June 10th at 7 PM we are hosting an evening with our friend, Dan Abbott, as he talks about how God has called him to service over the past several years. Dan grew up in Pleasant Valley United Methodist Church and has remained in our hearts even as his path has led him far across the country and the world. Dan found his soulmate, Annie, in Oregon where they attended college, and have since had many adventures together…not the least of which included marriage and a bouncing baby boy, Jesse! Dan is coming East to see friends and family, and while here he will be spending an evening at our church sharing his adventures following God’s path for his life. In addition, there will be wonderful music, provided by Bill & Becky Bridges, and, of course, some refreshments and time for fellowship following the presentation. On Sunday, June 12th, Dan will be giving the message at our 9:30 AM worship service. Everyone is invited to come to either or both of these opportunities to re-connect with Dan.